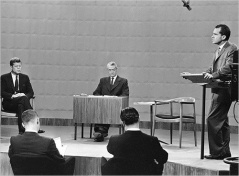 The first televised presidential debate set a standard for American politics. John F. Kennedy supposedly won that debate in September 1960 because he looked so much more rested and telegenic than his rival, Richard M. Nixon. There is, however, scant evidence to support that notion, which was revived yesterday in a commentary at the Daily Caller blog. The commentary suggested that Newt Gingrich’s beleaguered presidential campaign might find a spark during tonight’s debate in New Hampshire among seven Republicans seeking the presidency. Gingrich’s hopes to win the presidency probably were destroyed with last week’s mass departure of top campaign staffers and advisers. But his long-shot candidacy is of scant interest to Media Myth Alert. Far more compelling is the Daily Caller’s claim about the presidential debate in September 1960. It’s important to note that most commentary in the debate’s immediate aftermath called the Kennedy-Nixon encounter a draw. In the months afterward, Nixon’s sweaty brow and haggard appearance during the debate emerged as factors supposedly decisive to the outcome of the encounter — and to the 1960 election. Such claims, however, rest on more on conjecture than compelling evidence. David L. Vancil and Sue D. Pendell wrote in a revealing journal article published in 1987 that “the inference that appearance problems caused Nixon’s loss, or Kennedy’s victory [in the debate], is classic post hoc fallacy. That is, Nixon’s sweating under hot television lights could have stirred viewers empathy, making them feel more kindly toward the Republican candidate. It’s a plausible supposition. A Gallup poll conducted during the week following the debate and released October 11, 1960, reported that 43 percent of voters thought Kennedy “did the better job” in the debate, which was the first of four during the 1960 fall campaign. Twenty-three percent thought Nixon was better; 29 percent said both candidates were about the same. Five percent offered no opinion. But the poll did not specifically address the appearance of either candidate; nor did the poll detect a sharp swing of support to Kennedy. The survey reported Kennedy to be narrowly ahead, by 49 percent to 46 percent, with 5 percent undecided. That result represented a slight change from a Gallup survey taken just before the debate, which reported Nixon leading by 47 percent to 46 percent. But Gallup termed the post-debate shift too slight to be meaningful. By the way, Kennedy didn’t take off the day of the debate to rest and work on his tan, as the Daily Caller commentary said. The Chicago Tribune reported that Kennedy received “a boisterous welcome” in an appearance that afternoon at a carpenters union convention in Chicago, the debate’s host city.